^ Illustrated Historical Universal Ampelography InfoWine. Retrieved: 2012-08-24. Everhart, S.E. 2010. 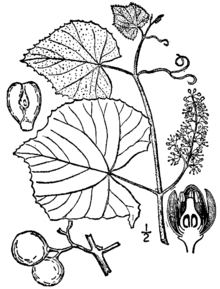 Upper canopy collection and identification of grapevines (Vitis) from selected forests in the southeastern United States. Castanea 75: 141-149. Galet, Pierre (2002) Grape Varieties: A Study of Wine, Hachette Wine Library (Cassell), 0-304-36409-6 is a decent summary in English. Schneider, Anna; Mainardi, Giusi; Raimondi, Stefano; ed. (2012) Illustrated Historical Universal Ampelography, L'Artistica Editrice, Savigliano.